Beautiful Incentives: Shopular shopping app Ugly Christmas Sweater Contest! 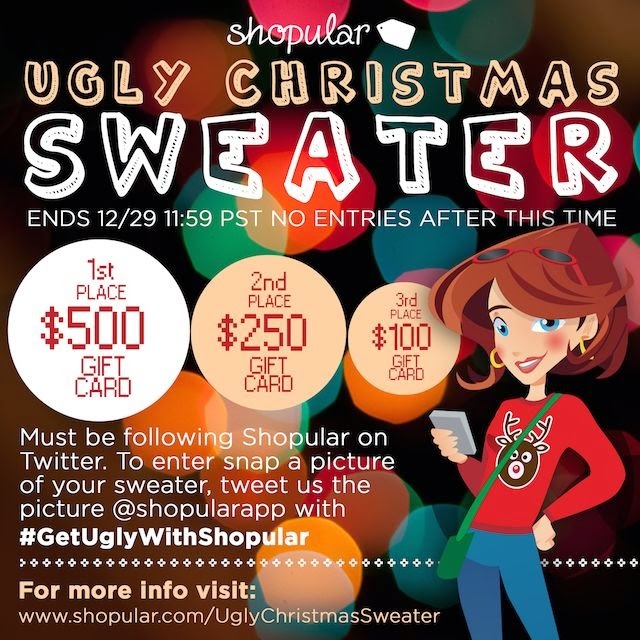 Shopular shopping app Ugly Christmas Sweater Contest! Who has an ugly sweater they want to show off? What about one that you want to get paid to show off? Then you've come to the right place! Shopular is hosting a giveaway to do just that. Shopular is a new app that I have been raving about during the holidays. It is basically your shopping bff, by your side handing you coupons, showing you deals and always on top of what you need when it comes to saving money. It is fully customized and personal and alerts you of only your favorite stores info when you are out and about. Only this best friend lives inside your phone. Shopular has been all over the news and has earned it's reputation among the best apps for shopping. You can also use some of it's features on your computer. It is probably my favorite app to grace my phone in a while. If you are still last minute shopping, I love the rush too, then you need this app for your final purchases, but also all the time, because it's just so handy. About that contest. If you have an ugly Christmas sweater, you definitely want to bust that out and take a pic of yourself in it, for a 1 out of 3 chance to win up to $500 in the form of a gift card for the store of your choosing. I have a corny cute one with two snowmen that says "Snow In Love", but it needs to be uglified more and then I'm going to enter myself! You can enter 3 different ways. Choose the Shopular Facebook, Twitter or Instagram. When you post a pic of yourself wearing the ugly sweater, be sure to do it on the Shopular social page of choice or all and use the hashtag, #GetUglyWithShopular. Find more info in the pic below! Go to Shopular contest info. Good Luck, may the ugliest win and Merry Christmas!